This textured knit dishcloth is super fun and simple to make. Dishcloths make for some of the best DIY gifts because  who doesn’t love a new dishcloth and  you can make them in under an hour! This post contains affiliate links. For more information see my disclosures page. Hello friends! It’s been so long since I have written a blog post… about 9 months or so I think?? To catch you up since my last post in June I started working full time and… we bought a house! It’s a cute little fixer upper that was built in the 1940s and I am hoping to get some posts out about projects and decorating things. To be honest the plan was to start back blogging again in January at the start of the new year but ended up not getting around to it, but in writing this post I am realizing that I totally missed blogging. It feels so good to be back! 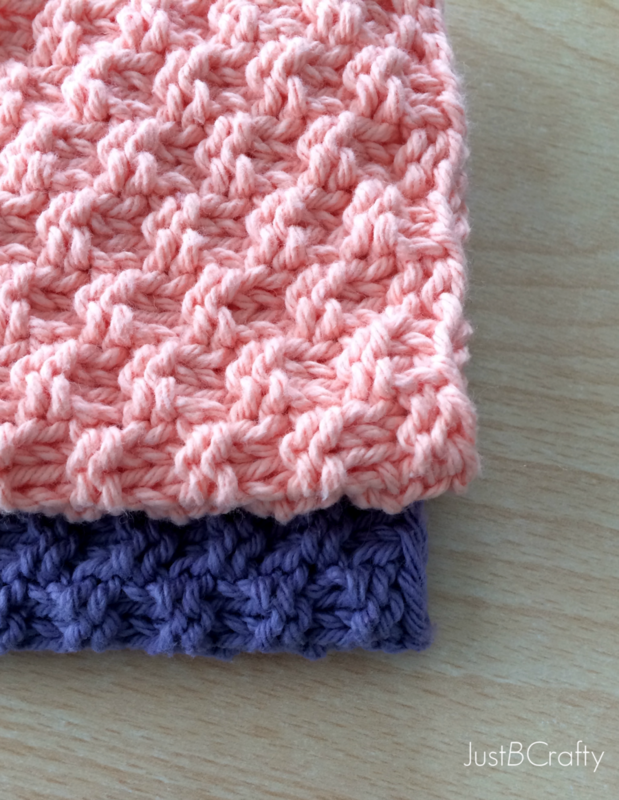 The other night I whipped up these Easy Textured Knit Dishcloths. They are super easy and quick to make. I actually ended up knitting them at the same time. My size 8 knitting needles are pretty long and left enough room for me to cast on both. I just knit normally and made sure not to tangle the yarn balls. A printable PDF version of this pattern can be purchased here. Cut yarn and weave in ends, you’re done! Fold them and tie with some hemp and it can make a great gift! 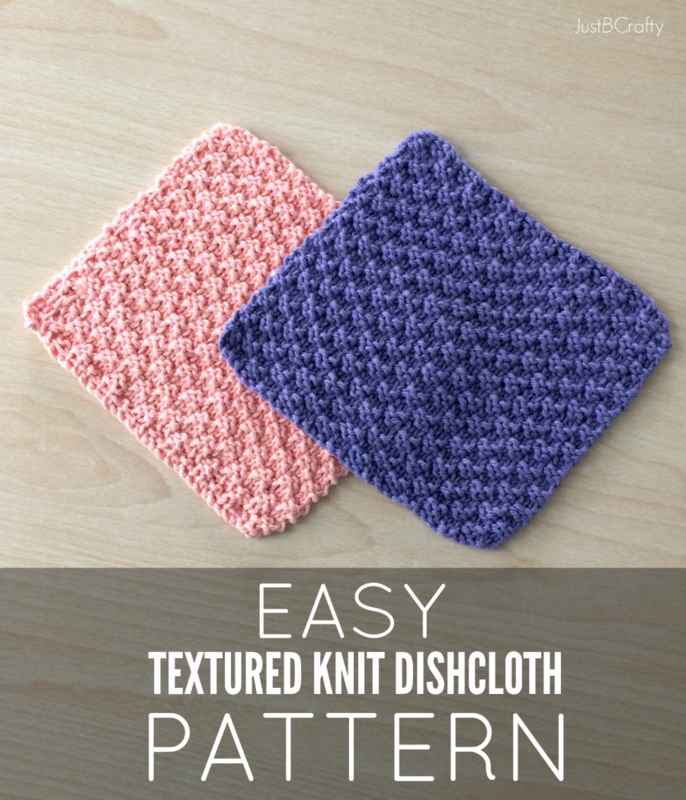 Will you give this textured knit dishcloth a try?! Let me know in the comments section below! Great stuff!! So easy for the beginners & for us “oldies” too!! Thank you very much! I am so glad you are enjoying the tutorials! I have actually never heard of cont. knitting so I Googled it and watched a youtube tutorial on it. I will definitely have to try it out! It looks like that technique allows you to knit very quickly (I am a very slow knitter, ha!). And that is so fascinating that you used to knit for the GI’s in WW11! How cool is that?? I am sure they loved those scarves, and really enjoyed them on cold nights. That was such a thoughtful thing to do! I enjoyed Gail’s comments and love that she is still knitting. I too am a continental knitter and don’t want to change. It is less strenuous on the hands and does let me go a bit faster…I’m not a fast knitter either. Love making dishclothes and will be using this pattern very soon. Thanks for posting it. Merci to you for your many scarves. The soldiers may have enjoyed a good laugh, but I expect that they were thoroughly charmed imagining the industrious little girls at home working to warm the troops. Judging from your comments, you haven’t lost any of your charm and good humor in the years since. Knit on! I agree someone should fix this page so the instructions and other information can be read. It is so light it is extremely difficult to see. I copy paste and then print which makes it easier to see, but sometimes one just wants to view the pattern first. Darken the print, please. Thank you for your feedback! I will look into this! Thanks-I subscribed to your pattern emails, but haven’t received any emails. Do I need to add your site to my contacts? Great idea! So simple and useful. I prefer crochet, but knitting is ok too. These dishcloths are great reason to practice my knitting. Most of the time I prefer cleaning with my own homemade cleaning solutions and the perfect addition to this is such a cloth. Made fro a proper yarn a dishcloth can clean every surface in the kitchen . Recently i crocheted tulle dish scrubbers and he worked great. Thank you for sharing your idea. Greets! Hi Lilly, thank you for stopping by! I agree, homemade dishcloths are the way to go! 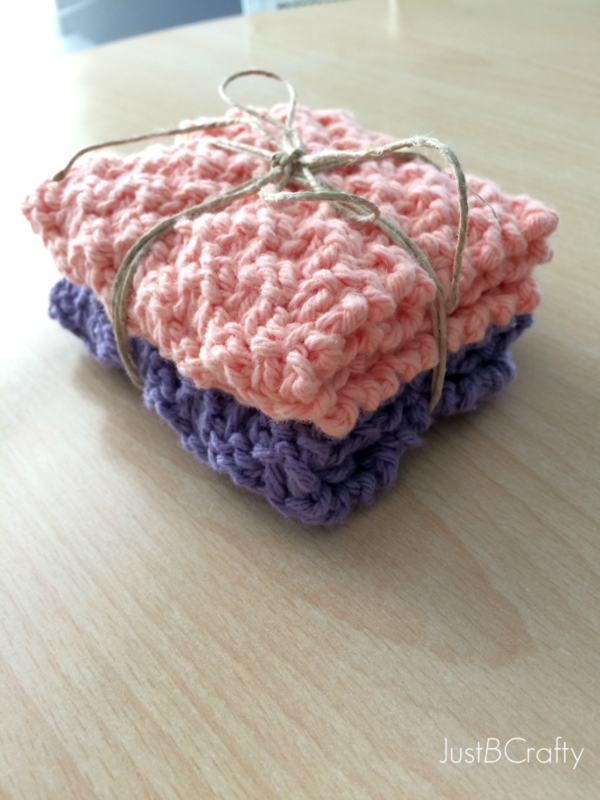 I am sure your crocheted tulle dish scrubbers turned out awesome! Years ago, I saw a book for turning lacey crochet patterns into knitting patterns. I did not get the book at the time and would be so grateful if someone could lead me to it. Love the dishcloths. Also great for exfoliating skin. Started with the basket weave and there are so many more patterns. So much better than those you buy. Hi Marylin! I forgot to include the finished measurements in my post! I don’t even have any more these dishcloths lying around to measure as I have given them all out as gifts, but they are about the same size as my other dishcloths which measure to about a 7″ x 7″ square. When I teach others to knit, I always start with Grandmom’s favorite dish cloth. I have found some useful and easy patterns here for beginners. Thank you! Hi Trysche! Thank you so much! Thank you. You inspired me. Hi Beverly! Let me know if you try out the pattern! 🙂 Happy knitting!!! When I come back to my knitting after leaving it for a day or so I have trouble remembering which row I am on. I have ripped this out a number of times but I was going on it pretty good and don’t want to start over. I have around 15 rows. I need the last row I did on a knit but I don’t know if it was the first or second row of purl 2 knit 2. Can you help me out? How long do I have to wait for my comment to be moderated? Hi Cathy! On future projects one tip that always helps me is to keep a pen and paper handy and write out 1,2,3… etc as I complete each row, so that way I always know what row I’ve left off on. For this particular situation, look at the last row you completed, and pay particular attention to the last two stitches (closest to your knitting needle point). The knitted stitches will look like “v”s and the purl stitches will look like a “bar”. If the last two rows are 2 “v”s and 2 “bars” or reversed, you will want to knit into the purl stitches and purl into the knit stitches as they face you. If you just see 1 “v” and 1 “bar” or reversed you’ll want to repeat the last row you just completed which would be to knit into the knitted stitches and purl and purl stitches. Does this help? Let me know if you need anything else! Just found your lovely washcloth pattern. Knitting 2 at a time is a wonderful idea. Thanks. I have one question and I know knitters have different tensions but do you have approximate dimensions on this lovely cloth. Thanks so much. Hope your house is coming along. Happy Holidays. Hi Chris! Thank you! The finished dishcloth ends up being about 7 inches by 7 inches. Happy holidays to you too! What a cure and easy pattern! Thanks for sharing it. Do not see Lilys sugar and cream in my part of Canada. What type of yarn? Weight and should it be cotton? I enjoyed making one of these although it is messed up because I lost track of where I was in the beginning..oops. To get it right I made a chart. I numbered lines 1-20 and whenever I finished a row I put a check mark in the box. Then do the next row and make a check mark. When I finished 20 I went back to the top of my sheet and started going down it again.I would never get it right if I tried to knit this without my chart to go by. The reason I only went to 20 is because 40 would take the whole page and why not just go back and start over? This is the only project that I have found that used yarn that I have on hand and needles the size that I have! I knitted when I was a teen and I am learning all over again at 63. Changing from knit to purl was hard for me to relearn but the more I did the faster and better I got. I love this pattern! Hi Marjorie! That’s a great idea! I have a difficult time keeping track of rows too, and its amazing how something so simple can make a project go along a lot smoother. And that’s great you had the yarn and needle size on hand…score! That’s always the best :). I want to know do you pre-wash the yarn for shrinkage before you knit? Hi Susie! No I do not pre-wash my yarn. The dishcloths do shrink a bit in wash/dryer, but once they are wet again they stretch back out. I love this pattern! I am wondering if one washcloth uses the whole skein? I would like to use the rest of a skein I have left after making a different washcloth. Hi Karen! They use about 1/2 a skein. Hope this helps! You can cast on as many stitches as you would like, just make sure that your cast on count is a multiple of 4. I tried these! They were great. I wanted to make mine baby washcloth sized, so I ended up using size 5 needles (I tend to knit large, so I have to size down a little bit anyway) and cast on 20 stitches. With 32 rows they turned out about 4.5″ x 4.5″ perfect baby size! Has anyone ever wished you a Happy #washclothwednesday!!! Message me and I’ll add you to the #washclothwednesday group board so you can post to itbwfore next weeks #washclothwednesday!!! 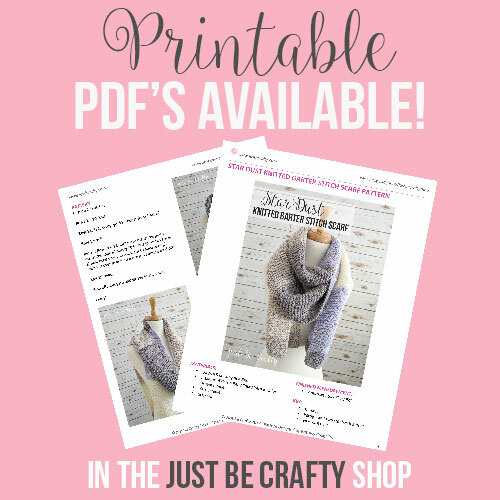 Pin your favorite sewn, knit or crochet washcloth patterns as well as your items for sale! 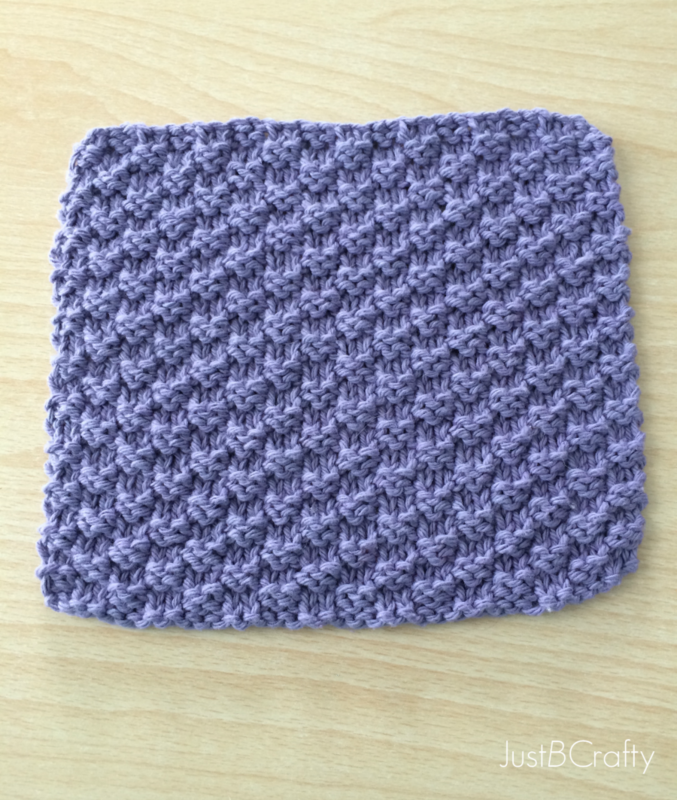 Just completed this washcloth pattern and really love the finished product! I think it looks best in a solid color, but trying to use up my cotton stash so picked a subtle colorway (Buttercream Ombré) and it actually worked out very nicely. Often a heavily textured pattern looks best in a solid color or you either lose the texture look or it becomes too busy. Not the case with this pattern! Softer ombré colorways look lovely as well. Thanks for a great pattern. Considering this post is over 3 years old, it’s really stood the test of time! Hi Judy! I am so happy you enjoyed the pattern! And I bet your dishcloth is beautiful! Soft ombres are always the way to go ;).